Need to stop your dog from escaping or your children from falling? K9gates has the answer. We make a unique gate to suit all your needs. Your K9gate fits into your doorframe without any permanent fixings, screws or holes. You can erect one of our k9gates in seconds. A K9gate is an essential piece of camping kit. Your door can be left open with a K9gate fitted 'Fresh air'. Your dog will be happy to see the world outside and no more jumping and scratching at the door with a K9gate fitted. Your children can play safely and not fall out the doorway with a K9gate. Been for a walk and have a wet muddy dog? Just use your k9gate to keep them outside or in the awning, no more wet muddy paw prints inside. Need us to fit your K9gate? We do have limited parking for your motorhome or caravan and we will fit your K9gate for you, we will even make you a cuppa! Purchase today, to use Always. "We pride ourselves on a very personal service and will always do what we can do to help. Many of our customers have had bespoke k9gates made to their own specifications, not only for their motorhome/caravan but also for their home." 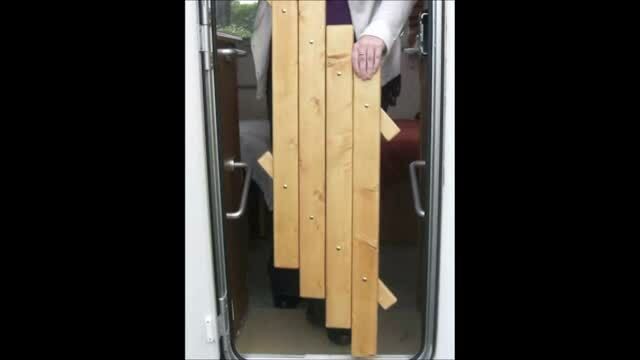 Need a K9gate for your Mobile Home/Static Caravan? Welcome no need to register to discover K9gates or shop on line..
We do love to see and hear about your K9gates, New site members are always welcome. Once you have purchased your k9gate please do leave us your feedback, it is very much appreciated and please do Like and Share our site. Thank you. Fantastic product. Great quality and an ingenious idea. I would have no hesitation in recommending K9gates. Great service and quick delivery. What a brilliant idea. Dogs are now safe and secure. We bought one of K9's gates for our motorhome at the Newark Caravan and Motorhome show in March. Despite being cynical, thinking it couldn't possibly be that easy, it was!! The kit was brill with everything in it that we needed. The gate is in deed as sturdy as we were led to believe it would be. I have no hesitation in recommending the quality of this ingenious product.....thank you!